Recipe by: Megan C. A. "A simple from-scratch lemon cupcake has blackberry buttercream frosting. This cupcake is a refreshing hit! 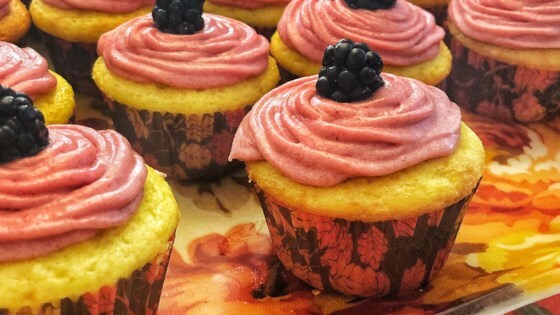 Garnish each cupcake with a blackberry or a pinch of lemon zest." Beat 1 cup butter with 1 teaspoon vanilla extract and salt until smooth and creamy. Beat in confectioners' sugar, 1 cup at a time, to make a creamy frosting. Beat in blackberry jam. Spread frosting on cooled cupcakes. These are cute, simple, and fancy cupcakes! Very yummy! Substituted strawberry preserves (just my preference).